With the draft nearly complete, we note that umpire Dana DeMuth has not appeared in a single 2018 Spring Training game. As such, we have invoked UEFL Rule 1-5, Qualified Alteration of Drafted Umpires / Authorization to Change Umpires After Draft But Before Season Begins. 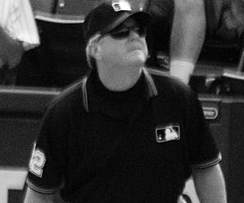 If you have drafted Dana DeMuth in any capacity (Primary, Secondary, or Crew Chief selection), you may replace him on your crew if you so choose; you will have until Thursday (Opening Day) to effect this change; no changes will be accepted following the first pitch of the first game ("before season begins"). Click here to submit a revised draft form (please indicate in the COMMENTS that DeMuth is to be replaced) or reply as a comment to this announcement.